Not only are backed-up, and slow moving drains a nuisance, but also they are unsanitary. With our quick and professional drain cleaning services we can clear blockages from your drain in no time. Whether your sink drain is clogged or your shower is taking too long to drain, we can fix these inconveniences quickly and efficiently. At Lightfoot Plumbing, we pride ourselves on delivering exceptional customer service. Our plumbers are fully licensed, arrive on time, and treat you and your home with the utmost respect. 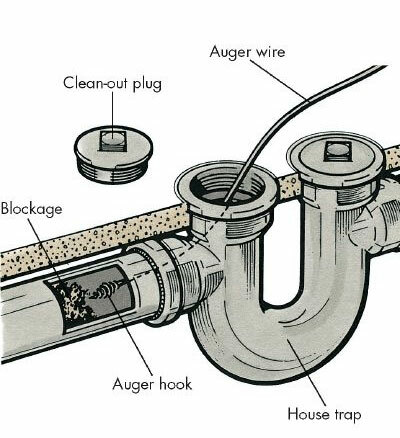 We fix clogged, plugged, and stopped up drains before they become a big problem. We’ve been in the plumbing business for decades and have come across just about any drain troubles you can think of. Problems tend to start small, so we advise that you keep an eye out for the signs that point to a clogged drain. If you notice that the water is draining away slowly then this could mean there is a clog in your drainpipes. You may have observed water pooling at the bottom of your kitchen sink before draining away or water rising to your ankles while you’re taking a shower. Have you noticed bubbling sounds when you flush the toilet or as water works its way down the drains? This tends to happen when trapped air tries to escape from the pipe. When you start to notice the smell of sewage coming from the drain, that usually means there’s a blockage. What you can smell is the same materials that are causing the clog, so you want to deal with the issue as soon as possible. Homeowners often attempt to deal with a clogged drain by using drain-cleaning chemicals. However, often the problem cannot be solved without the help of a professional plumber in Weatherford TX. If you find that the problem doesn’t seem to go away, then the best option is to get the help of an expert. A licensed plumber will have the tools and equipment to deal with even the most stubborn blockages. As a licensed professional, you deal with serious clogs caused by a variety of reasons. We know how to get to the root of the problem and effectively get it sorted. We pride ourselves on delivering excellent customer service to each and every one of our clients. Our fully licensed plumbers are well equipped to deal with any sewer line problems you might have, no matter how complicated the issue may seem. If you’ve noticed a problem with your drains, you shouldn’t wait around too long to get it fixed. While it may only seem like a small inconvenience to you now, it could turn into a big problem if you don’t address the issue straight away. Our plumbers are available to take your call 24/7, so if you notice a problem, give us a call as soon as possible. We have proudly been serving Weatherford TX and surrounding areas since 1983. We are available any time of day for small or large drain issues, offering everything from drain cleaning to sewer line replacement and A/C clog services. We have the right tools and knowledge to complete the job to the highest of standards. If the time has come to get your pipes cleaned, our drain cleaning services are what you need. With over 33 years of experience, we provide excellent plumbing services in Weatherford Texas and surrounding areas. 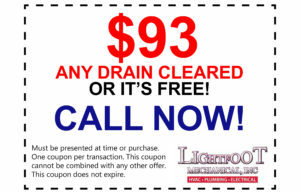 If you are in need of a licensed plumber, whether you live in Burleson or Aledo, just give Lightfoot Plumbing a call. We are on hand to take your call 24/7 for your convenience. Call Lightfoot , our highly experienced plumbers are on hand to serve you day and night!